Surf Side Cottages began as "Surf Side Colony," a community of seaside, Cape Cod cottages in South Wellfleet in the late 1940's and early 1950's. This cottage colony had a number of owners over the years, and in 2005, they were sold as condominiums. This means that each cottage now has a different owner, but they all are still available for rent to individuals and families looking to stay in a cottage by the sea. 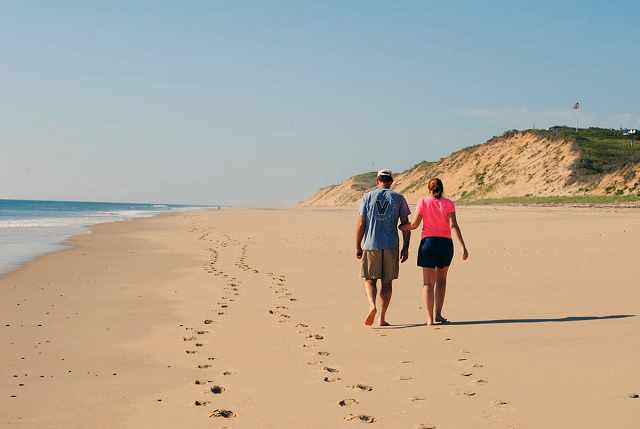 Armand and Lisa Audette founded "Blue Sky Property Management" in 2008, after successfully managing (and owning) The Even'tide Resort Motel and Cottages, also in South Wellfleet. With a combined 87 years of successful hospitality experience on Cape Cod, they know how to treat the Cape Cod visitor. This is attested to by the many positive comments and reviews they've received and by their winning numerous "Top Rental Manager" awards by FlipKey.com, an online rating company. Our philosophy has always been that a successful vacation is one where the renter is pleased with every aspect of their stay and not just with their accommodations. We freely "dispense" information about the area, let you know what you should not miss while you are here, and even more importantly, we point out places to avoid. We believe that helping you have a great vacation will make you inclined to return and to recommend us to your friends and family. In fact, the majority of our renters have either been with us before or were sent to us by someone who has stayed with us in the past. We hope you will join their ranks, too! Find the perfect cottage now!